So, it's expensive and you don't get that much of it*. Let's cut to the chase - is it any good? ... Yes it is. This is really good. I would go so far as to say it's bloody awesome. This product is aimed squarely at those of us with dry and/or maturing skin. If you're a face oil fan however, and in neither of those two camps, I would still recommend you look at this. If you have really oily skin, you can probably skip this particular product. Sisley recommends between three to seven drops, morning and evening, either alone or as part of your skincare routine. What I have found is that around three to four drops is more than enough to do my entire face and neck, and honestly I think I could easily do most of my upper body with seven drops! To use, simply put the drops onto your fingers, rub your hands together briefly and then press them onto your face and neck, making sure the product is distributed everywhere (personally I also go behind my ears, where I can get dry patches) and I also go right down to the base of my neck / collarbone. It's a dry oil so no messy greasiness here upon application, just nicely smooth silkiness. My personal preference is to do this as part of my evening routine only. I want to get the maximum benefits from this product by having it on for maximum amount of time possible. I want to spare it - it's not cheap! And for me wearing oils in the day time isn't really a runner because I wear makeup to work every day and I have found from experience that it slides right off my face if I wear an oil underneath. The difference this oil has made to my skin, right from the first application is very noticeable. It's plumper, softer and the texture of my skin is probably the best it has ever been and it is down to using this oil. Even on it's own, with no other serums or moisturisers, it stands on its own two feet performance wise. Because it's a dry oil, it sinks into the skin almost immediately. 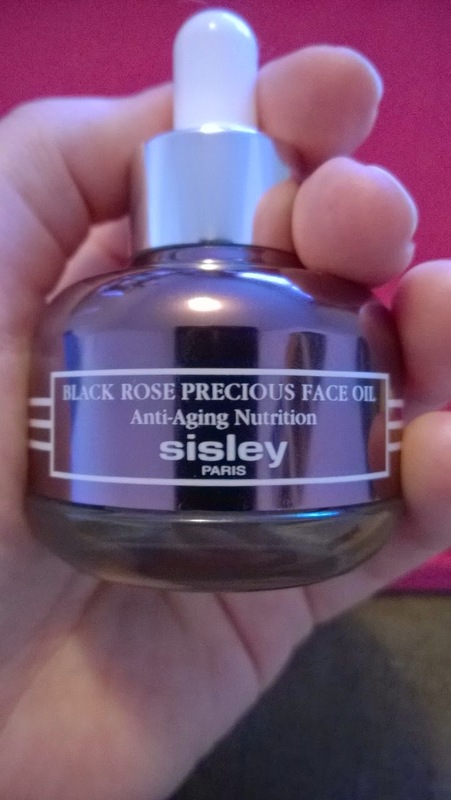 Sisley call this "anti-ageing nutrition". While the phrase "anti-ageing" irks the hell out of me, I can wholeheartedly nod along with the "nutrition" bit - it's probably the best way to describe how my skin feels after I've applied this; nourished. Ingredients wise, it's packed with vitamin E, omega rich carmelina and plum oils, extract of patina pavonica (which stimulates the synthesis of hyaluronic acid) as well as essential oils of rose, magnolia and geranium. It's not as heavily scented as I thought it might be, but it most definitely smells of roses - as you might expect from the name - so if you're not that keen on the smell of roses, move right along. 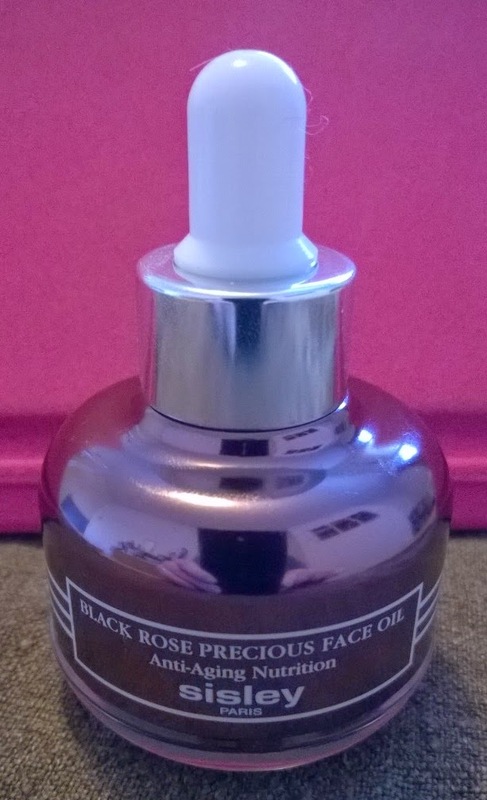 I'm a great believer in face oils and this is without doubt one of the best I've ever tried. If it isn't for you, rest assured there are great alternatives out there (try some of the Clarins face oils, much more affordable and what I've used and loved to-date). If you think you're still interested, read more about it here. Anyone who reads my posts knows by now that if I've said it once, I've said a thousand times :-) how and on what you choose to spend your hard-earned cash is nobody's business but your own! For all that, I am conscious of the fact that sometimes I recommend products that are expensive in anyone's language. It's one thing to recommend, say, a serum that's just over 20 quid (which is a lot for some people, I know that too) but quite another altogether when a serum will actually set you back the cost of top notch winter coat. With change. However these products do exist and therefore people will want to know if they're any good. What you will always get from me is an honest, tell-it-like-it-is review. Whether you then buy or not, is entirely up to you!